Cole Galloway from the University of Delaware, in an exclusive announcement on PT Pintcast, shares details on his next major project to bring mobility to the masses in the form of two houses. These houses will feature harness systems and be lived in by patients with neurologic injuries. Cole hopes that the project will highlight the need to get people better, in their environments. PT Pintcast proudly poured by Aureus Medical Therapy Team. Travel & direct hire opportunities nationwide. What are PT students ACTUALLY thinking? LIVE from NC Student Conclave! 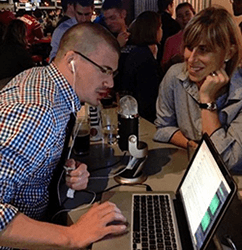 PT Pintcast the premier podcast for the profession of Physical Therapy. It’s hosted by Jimmy McKay, PT, DPT who talks PT with the leading minds in the field, over a beer.